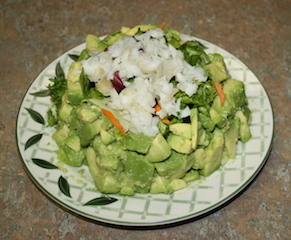 I had a lump crab avocado salad at a restaurant which was so good and hopefully didn't have anything in it to compromise my diet, so I decided to try to make it at home. It was a little tricky because there was basically an avocado bowl with salad in it and crab meat on the top. there was a nice siracha sauce which I am sure was not in guidelines, but I am making mine in guidelines if possible. 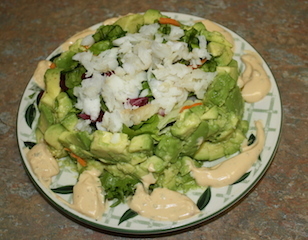 I substituted cod for the crab meat and managed to make the avocado container. My salad was now an avocado fish salad or maybe avocado cod salad. The restaurant used romaine lettuce in their salad and I used a field mix. The first step is to choose a bowl or a container of some sort to build the sides of the salad, I used an empty cottage cheese container. Grease the outside of the container or bowl with butter. A ramekin might work also. Then peel and chop about 1 1/2 large avocados. Squeeze the juice of half a lime and mix into the avocados with a bit of sea salt. Stir gently. Press the avocado around the outside of the container about half way up the sides. Gently remove the container. You can make it a little deeper if you like, but this was just right for us. You now have a circular wall. I put one layer of avocados inside the circle. 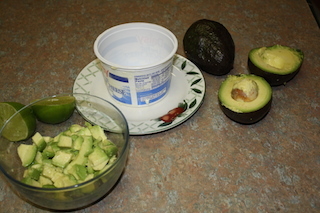 It is also nice to mash the avocados inside a little more to fill in all of interior at base. Next step is to fill inside of the avocado walls with salad greens. I cut the greens with kitchen shears to have smaller pieces. It could be eaten now, but it just needs a piece of cod cut into small pieces or crumbled on the top to make it avocado fish salad. The cod was pan fried in butter (or you could use olive oil-healthier) until tender and flaky. It might be healthier to bake the cod instead of fry it. Now add some garnish. This salad has a small amount of natural chipotle ranch dip used as a dressing. This is big enough for two, but my hubby can eat it by himself so you better make two. I believe a bigger plate would make a nice presentation. enough field greens or any green salad mixture to fill the avocado mold you make. Add cucumbers and tomatoes if you like. Container to support avocado wall while you build your "avocado bowl". dressing of your choice or no dressing at all. Grease the outside of the container with oil or butter. Some people use a large tuna can for this. I use a medium Daisy cottage cheese carton. Chop the avocados into small pieces and add juice of 1/2 lime. Stir gently. Press the avocado around the outside of the container about halfway up the side. Gently remove the container. 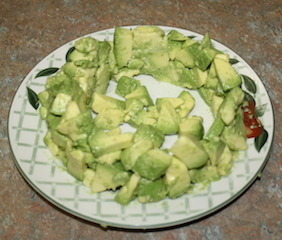 Put more avocado mixture in the bottom of the avocado walls so that it looks like an avocado bowl. 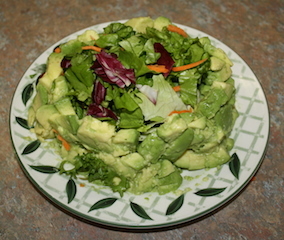 Add salad greens to avocado container you have made. Crumble fish pieces on top. Put dressing on plate wherever you want or just a dollop on top. 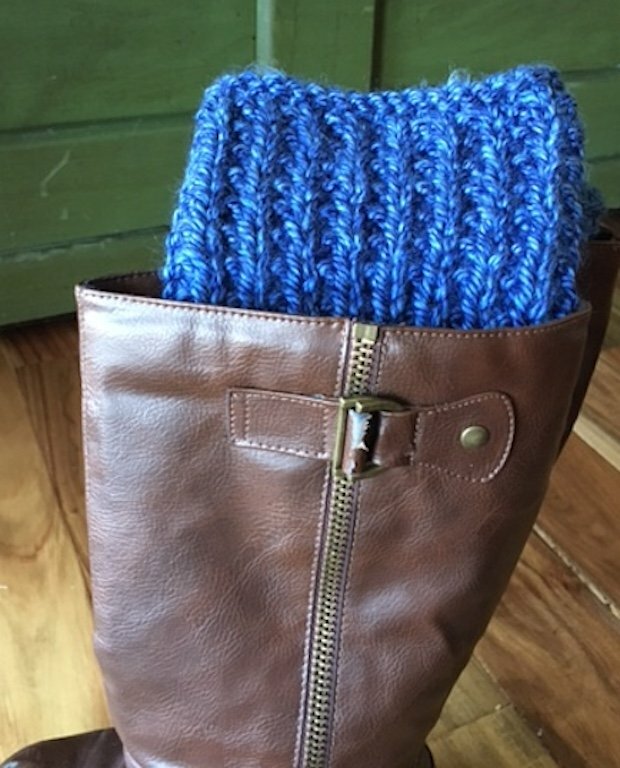 "For more recipes, click on recipes in the menu at the top of the page."